There is a tension developing in some quarters between the existing GP federation and the emerging Primary Care Networks (PCNs). It is like they are trying to compete for the same ground (at-scale general practice), and the result is a growing discord between the two. A conversation develops about what the federation “offer” is for the new PCNs: will it be for all of the £1.50 per patient running cost, or just a proportion of it? And what do the PCNs actually get in return for this investment of their money? Federations can feel they have to justify their offerings, and PCNs can feel they might not be getting value for their investment. What about the existing work of the federation? Much of it, such as the delivery of extended access, is funded through monies that in future will be coming through the PCNs. Will this work continue in its current form, or will the new PCNs demand a different model of delivery to that insisted on by the commissioners? If it changes, will the GP federation even have a future? It is easy to understand why tension between the two develops. For me, however, this tension misses both the point and the opportunity of general practice operating at scale. Inherent to both PCNs and GP federations is a membership of GP practices (generally the same GP practices). The point of working together (whether because they choose to or “have to” because of the new GP contract) is to be able to better serve these member practices and their populations. This is true for both PCNs and GP federations. The practices are the underlying constant. 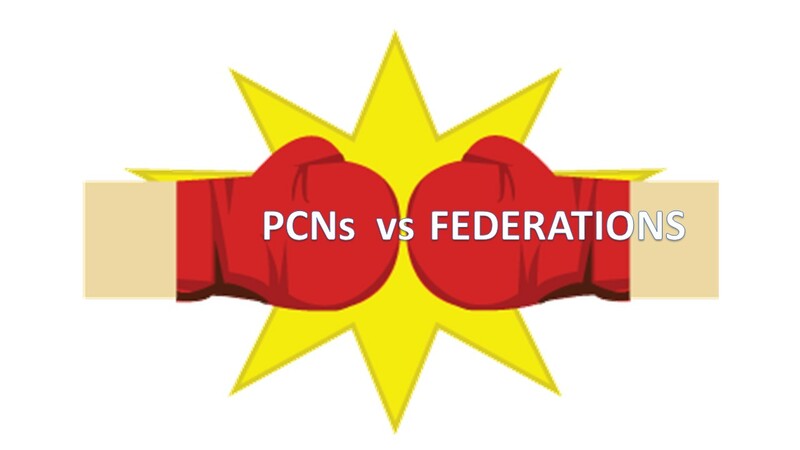 So the best place to start the conversation between federations and PCNs is not who should be doing what, and how much they are going to be paid for it, but one between the member practices as to what the relationship between the two is going to be. The conversation should really be between the practices themselves, working out what they want to do together at PCN level, and what at federation level, and then to organise themselves accordingly. For me, the most logical step is for the new clinical directors of PCNs to either become the Board, or at least have a majority on the Board, of the GP federation. This removes the unhelpful sense of competition between the PCNs and federation, and instead enables the PCNs (as the group closest to practices and that hold the majority of the funding) to ensure the federation delivers exactly what the PCNs need. There is no reason why existing GP federation directors can’t stand and become clinical directors of the new PCNs. I was asked recently as to whether this would be a conflict of interest. This question only makes sense if your starting viewpoint is one of competition rather than collaboration between federations and networks. If the role of the federation is to serve the networks, not only is it not a conflict of interest but it is a pragmatic response to the emergence of PCNs. For areas that have a GP federation the opportunity exists to have the best of both worlds – scale where it is needed, and a focus on individual local needs. A GP federation and PCNs working in harmony can secure more investment and resources, create efficiencies by reducing duplication, establish robust and tailored mechanisms for service delivery, limit liabilities, improve patient outcomes, and strengthen the collective voice of general practice. But whether practices can take this opportunity may depend on their ability to ensure the conversation is focussed on how to deliver the most benefit to practices, rather than one that is competitive between the two. This is really helpful, as a relative newcomer to a management role in a Federation I’ve been surprised by some of the ‘them and us’ that has arisen since the contract landed between practices and the Fed. Having a membership organisation with an understanding of how to provide at scale, strong relationships with community and acute and the CCG should be an invaluable asset to emergent PCNs, persuading practices to see this as a benefit rather than a threat is a challenge I wasn’t expecting!